Multisport races, Navigation is a key, common sports included; mountain biking, running, kayaking, orienteering, rope work. La Petite Trotte à Léon is now in its second year although this year the course changed by over 80% from the previous year, with much of the course at higher altitude and along more technical paths. Mick Kenyon, Paul Vousden and Matt Hicks signed up to tackle this challenge. • Team of three inseparable from the start to the finish of the event. • Course of about 245 km for about 21,000 meters of positive altitude change. • Course following mapped paths, featured on a map made available to each but not signposted. • 100% Mountain and Nature course (less than 5km of tarmacked roads). • Start at 10pm on Tuesday 25th of August. • To be completed by Sunday 30th August at 4.30pm. • Event in complete autonomy with refreshments and rest the different refuges passed through. We arrived on Monday evening to temperatures in the 30’s. The registration wasn’t until Tuesday so we had a little time to explore Chamonix and have a good feed. At the chalet Whymper where we were stopping was another British team taking on the challenge, ‘Team Martlet Kayak club’, in total there was 3 British Teams, the all female ‘Midget Gems’ making up the 3rd Team. It was a broken night’s sleep with the nerves jangling and a massive Thunderstorm echoing down the valley adding to the apprehensiveness. Tuesday came and it was warm and humid which supported the predicted Thunderstorms for the first night of the race. At 4pm we went and registered and dropped off our 2nd bags (which we would collect at Morgex), there were no kit checks; the organizers said they trusted us and we would be foolish to skimp on any of the mandatory kit. We were given a GPS tracker and 5 sets of batteries adding to the weight of the usual mandatory kit including; sleeping bag liners, fleeces, jackets etc. and food required to get us round from refuge to refuge. We had already realized that we were not to be passing through many villages or towns in this year’s event so needed to make sure we had enough food. Following the kit check was a briefing; this was conducted in French with a very much briefer English translation! At 7pm a meal was provided by the organizers, we made our way to the canteen briefly getting lost, hoping this wasn’t a sign of things to come. The meal was a spag boll; this was to become a theme of the race! A few bottles of water were provided but these were all used up by the time we got to our turn, this left either beer or wine, with only 3 hours to the race we declined. We went back to the chalet for last minute faffing with bags and time to get changed into the running kit and visit the loo as many times as possible. The rain outside was getting heavier and we debated heavier waterproofs but decided to stick with our lightweight Haglofs Oz pullover jackets. We headed to the start line at 9.30pm, the rain had subsided and it was to be a brief dry start to the race. By 10pm a large crowd had built up around the square and was lining the streets, it was certainly quite humbling that all these people had turned up to wish us “bon voyage”, something you just don’t get in Britain. The motivational theme music of the UTMB blasted out as we set off, aptly named Conquest of Paradise (Vangelis). At 10pm prompt we set off on our journey. The first 10km was a nice warm up, pretty flat and on good tracks following the UTMB route but just before the first of the big climbs the rain started coming down and thunder and lightning started filling the skies, not a comforting thought when you are about to climb alongside a ski lift up to nearly 2000 meters. Matt “Stato” Hicks was counting between the flash and thunder and informing us that the storm had started some 20 miles away but was now less than 5 miles away. The rain was relentless for most of the night but fortunately reasonably warm. We briefly left the UTMB route after reaching La Charme dropping into Saint Gervais before again rejoining it at Le Champel. 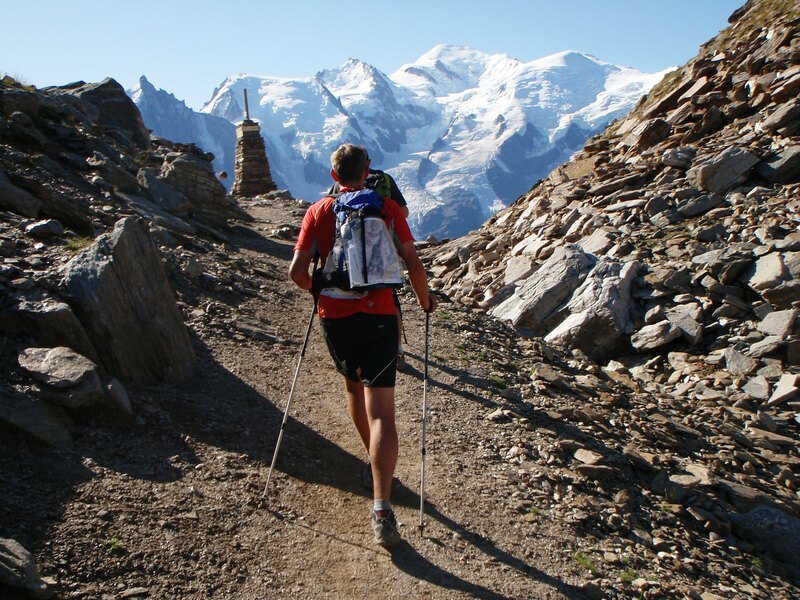 We followed the UTMB route until shortly after La Balme refuge (which was closed in the middle of the night). We then split from the UTMB route for our first taste of what was to come, heading off up a very rough steep climb with lots of loose rocks, at this point quite a few team were still grouped together and those above periodically set off small rock falls keeping us awake and alert as first light started to be seen. It was a relief to reach the Col d Enclave (2667m). At least the rain had passed by this point and the morning was bright and spirits lifted. We headed to Refuge Robert Blanc (2760m) along a rocky path down the mountain before it climbed steeply up and over a boulder field. Once at the refuge we took time for our first meal and a brief rest, we had covered 41km and a fair bit of climbing over some difficult terrain (this was nothing compared to what was about to come) The cans of coke soup and bread were welcome. After a short hour we set off again along the boulder fields and paths crossing the melting Glacier streams, we were to have our first taste of the many more tricky paths where chains were bolted to the rocks to help prevent falls (and presumably you damaging the rocks as you fall on them from great height). As we descended to one on the river crossing points a French team behind us dislodged a boulder. He shouted a warning in French (it might actually of been “take that”) but whatever it was we heard it just in time for Paul “The Joker” Vousden (explanation to come) to look up and duck below a crashing boulder that would have finished the race early and more to the point might have broken the GPS we had borrowed. We carried on to cross the UTMB route at the Italian Border at the Col de la Seigne. From here we made our way over to Petit St Bernard crossing more boulder field’s moonscapes and steep climbs. Once we reached the refuge we made the decision that we should re-fuel and rest, we had been on the move for 18 hours and awake for 30+ hours, we ate our Spag Boll and took an hour’s kip in the marquee tent provided, it was cold and noisy. We got up and made the most of the couple of hour’s daylight remaining. Along with nightfall the rainfall returned. We came across the ….Kayak clubs support crew bivying out at Col Louie Blanche with a bottle of wine, salami and cheese. Later that night there idyllic bivvy point turned into a river and they had to make a hasty retreat to dryer land. We descending a difficult boulder field with an indistinct path before improving. A couple of teams had missed a river crossing point and were too low down the valley, they spotted our head torches and we could imagine the relief they felt to get an indication of the true track. We continued through the darkness and made a decision to pre-book the refuge Deffeys (2494m), the race organizers had provided the refuge numbers to book ahead (we lost this piece of paper after this point!). We finally arrived there at about midnight and grabbed some more Spag Boll before retiring for a couple of hour’s kip. The dorm was a small one where a lady with her 2 children were sleeping, it must have been a shock for her to have 3 smelly guys turn up snore for an hour and then get up to their alarm clocks. A quick breakfast and off again into the beautiful early morning. After leaving the lodge we climbed another 400m to Haut Pass (2869m) again up steep and rocky path. Once reaching the top we descended a very long way into the town of Morgex (884m). As we approached Morgex we could hear the speakers announcing our arrival only to find it wasn’t for us but for the Giro Italia cycle race…. (not famous just yet). In the sports hall awaited our 2nd bags and we took the opportunity to grab a quick shower and some food before one of the longest climbs of the route. We left the sports hall in the midday heat and it was uncomfortably hot. We each carried 1 litre of water and in the heat and with the severity of the climb this soon ran out, we were relieved to find a water trough half way up the ascent where we replenished our supplies but this water was not to last long. We carried on climbing with no shade and the water ran out well before the summit but we dug deep and carried on with the promise of water near the the col of Tete Licony (2914m) which seemed to be guarded by the huge avalanche prevention nets strung across the mountain top. Paul was suffering with chapped lips and took to the sudocreme, he smeared it across his lips and with his blue sunglasses on looked like “the joker” out of batman. This sight was to be seen many times before the end of the race and even a call was put into the finish line to make sure a supply of lipsalve was available. We weaved between the avalanche nets and finally reached the water supply which looked not much better than a stagnant pond, but we were desperate and so filled our bottles and added some water purification tablets and nuun to hide the taste. It still was not very pleasant but needs must. We continued on a tricky descent, I had de-hydrated and soon finished my pond water on the long and tricky descent where we lost 1000m in height. I was getting desperate for water and was so relieved to hear the sound of a stream. This turned out to be water many thousand of years old in the form of Glacier melt however I filled the bottles and drank without ill effect. We then regained some of the height lost before descending at midnight to the refuge we voted as the best refuge by a long way. We reached the five star refuge Bonatti (half way point on the route) where good quality soup and Spag Boll was consumed. We retired to the dorm for what we hoped would be 4 hours sleep, this turned out to be a lot less as more teams arrived and alarm clocks signaled to other teams it was time to leave. We got up and had our first healthy breakfast of fruit and juice which was so needed. Refreshed and refueled we got on our way in the darkness of the early morning along part of the UTMB route, the sun rose and we were treated to fantastic views of Mont Blanc massif in an orange glow, it was quite a sight and lifted our spirits. We continued on the UTMB route and started the climb of the Col Ferret before veering off to go over the Italian/ Swiss border at col du Ban Darray(2695m). Much to our amusement someone had done a big curly pooh on the knifedge ridge…don’t ask why we found it amusing or why the person had dropped it there! We were joined by a French team for the descent down a lovely Swiss valley, every so often the path was blocked by an electric fence, one of the French team was vertically challenged and rather than stepping over the wire lifted the stake out the ground. We crossed one of the fences and heard a commotion behind us, the cows had followed the French team over the electric fence and a stampede of friendly Swiss cows making there dash for freedom was on it way. To make things worse the farmer was observing this from some distance away, he started screaming instructions which we soon managed to work out he wanted us to heard the cows back up the valley…little to say we did our best waving our poles in the air and mooing! Onwards we continued and the next section was cruel loop that climbed up over a col down a valley and back over another col a couple of miles away from where we had started the loop. A warning was posted in the route book not to descend in bad weather; it was very steep and slippy with big vertical drops at the side of the path and continued to descend for 1000m, the weather was luckily good, the organizers were right, I would not like to have descended that in the rain or worse. We reached the village at the bottom and took advantage of little restaurant where they served us Spag Boll! 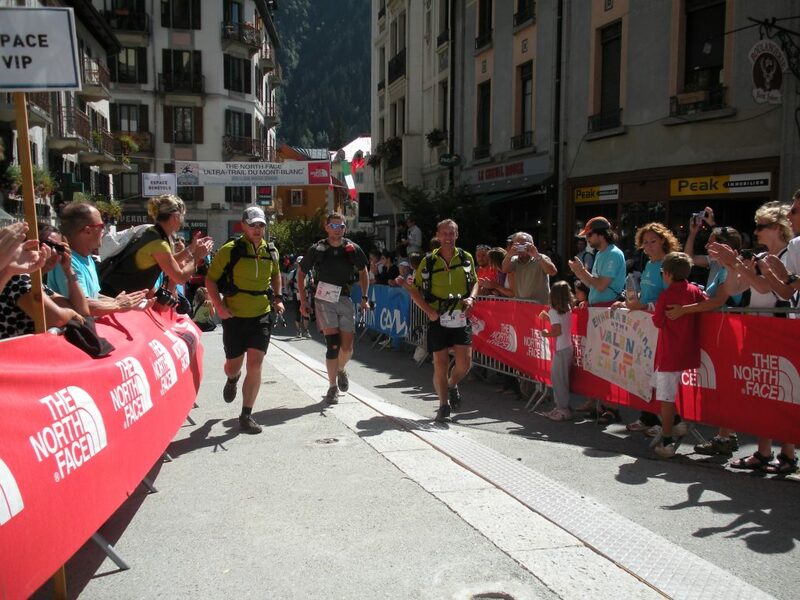 After the brief rest we joined the UTMB route were the front end of the CCC race were passing. We even managed to see a friend who briefly wished us luck and gave us encouragement (well done Alex Pillkington on finishing about 90th…great run). We were heading towards Champex which was only a few miles down the valley but not the way our route was taking us, instead we had another big climb up to Orny (2691m) and descent on the other side before we could rest. The climb up Orny was steep and again we were having water issues, descending were a group of climbers and we managed to beg some water from them (we owe them at least a beer or 2 if anyone knows who they are) Darkness fell as we reached the peak and although spectacular views were seen briefly the cloud came in. We were descending and at times used the chains attached to the rock face not knowing what was at the side. The next few Kms were tricky with visibility less than 3m, the headtorches light bounced back at us and we were very reliant on the accuracy of the GPS, luckily this was spot on. We were all feeling tired and thought we were getting sleepmonsters when the street lights below were seen as a giant glowing orange star….it turned out it was a giant glowing orange star and not street lights, it was standing above the ski lodge which on a clear night would be visible from Champex. We descended the black ski run twisting and turning all the way into Champex occasionally losing our footing and on number of occasions falling over. At Champex we re-joined the slower end of the CCC runners before turning off the route for the refuge for the night Auberge du Bon Abri, arriving in the early hours. Again we had a Spag Boll and 2 or 3 hours sleep before setting off in the early morning darkness. We had made it through this cut off with 15 hours or so to spare. The next cut off was at Vallorcine at 16:00. This was only 25km away but with 2 major climbs and on the terrain we had been crossing could be quite tight. We started the day with a 1200m climb but made good steady progress, the tracks seemed to be improving and the descent on the other side was a lot better than we had come to expect. As we approached the bottom of the climb we had a call to say we were not moving on the GPS system, I had inadvertently dislodged the USB cable. Friends and family watching were getting twitchy and we received a few calls asking if we were okay? With the GPS back working we made good progress and soon climbed to Col de Balme (2204m) before another descent into Vallercine. As we descended the first of the UTMB runners passed us making it look so effortless, first there was last years winner followed by the Japanese runner. We could hear the cheers and support in Vallorcine and before long we were welcomed and encouraged by the gathered crowds. We had made the cut off with an hour to spare. We discussed why the cut off was so early as we only had 30km to go and 24 hours to complete, surely anyone could do that? Matt “Stato” then pointed out that in tiredness there had been a conversion failure between miles and Kms….we had 50km to go and the highest mountain of the race to navigate. We set off after a rest and refuel with 30 mins spare before the cut off. Mid afternoon and we wanted to make the most of the daylight, the climb was steady but on good tracks and so we made good time planning what we should do to finish the course as we climbed. 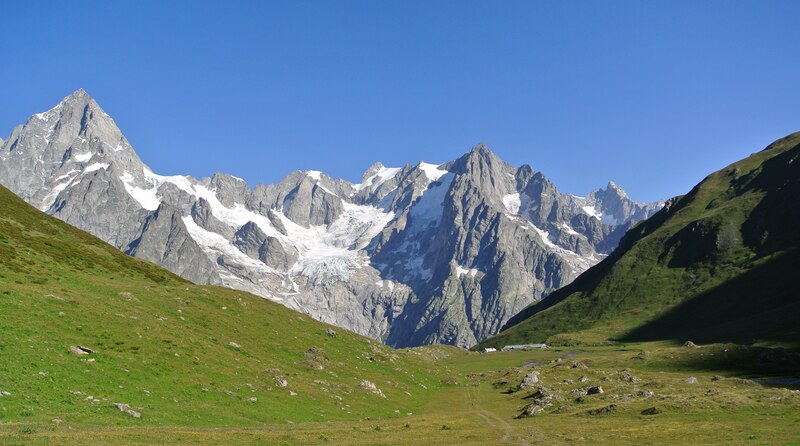 The plan was to reach Cabane du Vieux Emosson in good time get a bite to eat and then tackle the start of the big climb in darkness hopefully timing the tricky via ferrata section to be done at sun rise. We made the progress we needed and reached Emosson just as it got dark. We ate but the only place to sleep was a base tent erected round the back of the cabin. We climbed into the tent, we were the only ones there so took 2 blankets each. Just as we were dropping off to sleep another team joined us and then another, we had to relinquish the blankets. We agreed we were not going to sleep so it would be better to push on. The climb up Cheval Blanc was steep and rocky, we could see headtorches down below at Emmoson but no one was following us out into the darkness to tackle the mountains at night, we knew this was a tough section and this was to be made even worse by the lack of sleep. We made the top of Cheval Blanc (2816m) where the track disappeared only marked by the odd cairn, these too eventually disappeared. We crossed scree which was collapsing under us and for a while doubted whether we were on track but we eventually reached the foot of Le Buet. The last 200m of climbing was on via ferrata cables, but we had no harnesses to protect us. Thank goodness for darkness which hid the steep drops into oblivion? We finally crossed the summit of Buet (3082m). The long descent ahead was tougher than the climb, without the adrenaline to keep us awake the sleepmonsters attacked. I tried to shut one eye at a time but this didn’t work as the other eye wanted to join in. I was getting desperate for sleep (I think we all were, there was no chat just the click of the poles on the ground) I was about to drop on the track. We finally turned a corner just as the sun rose to see refuge col d Anterne. It was the most welcome sight and almost like a mirage. Despite the daylight there was no skipping through here. Too tired to eat we set the alarm clock for in 1 hour’s time, despite being so tired I awoke before the alarm and felt totally refreshed; it’s amazing what your body can do if it has to. We grabbed a quick bite to eat and set off. We only had 2 descents and 1 climb left…we knew we had done it! 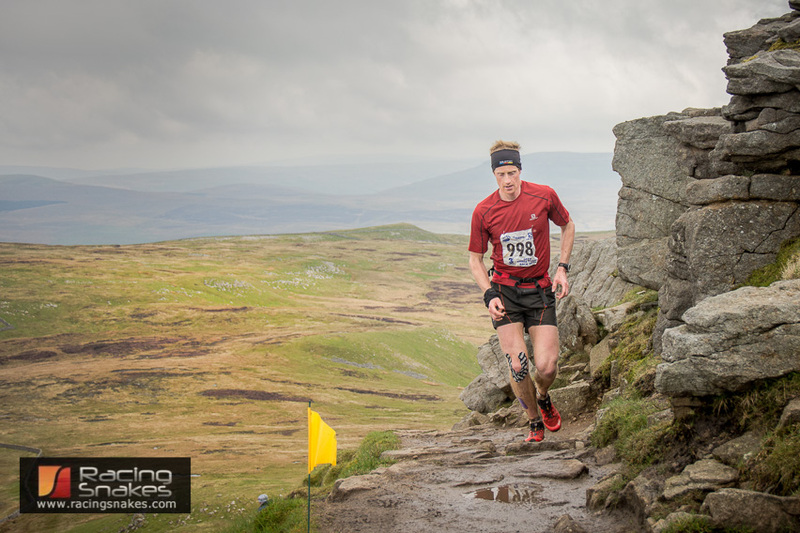 This entry was posted in Adventure Racing, Trail Running, Ultra Running on February 12, 2013 by racingsnakes. This entry was posted in Adventure Racing and tagged 2013, adventure, adventurerace, championships, openadventure, racers, racing, trail, uk, welsh on January 30, 2013 by racingsnakes. 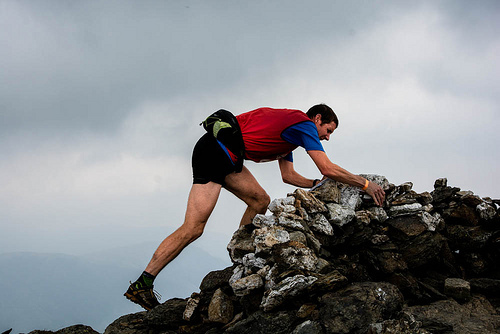 The HEBRIDEAN CHALLENGE (The Heb) is back in 2013. One of Britains iconic adventure races returns with ‘Durty Events’ (the winner of the ‘Triathlon of the Year 2012’) organising the race. Gary Tompsett an experienced adventure racer and planner will be in charge of putting together this challenging course set in the Hebridean Islands. This entry was posted in Adventure Racing, Uncategorized and tagged 2013, 2014, adventure, challenge, event, heb, hebridean, navigation, race, racing, uk on January 30, 2013 by racingsnakes. This entry was posted in Adventure Racing and tagged 2013, adventure, chamiponships, racing, uk, Wales, welsh on January 30, 2013 by racingsnakes.